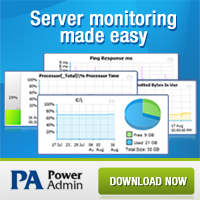 Monitor server CPU, memory, ping, SNMP, syslog, traps, event logs, services, etc. Monitor distributed networks without requiring agents on each server. Flexible alerts and rich reports round out the product. Free iPhone and Android apps let you stay informed even while you're away. Network Inventory Advisor audits all network software and hardware simply and efficiently. It automatically discovers all your network assets, scans them and builds ready-to-use network inventory reports. Anyplace Control is a super fast utility for remote PC monitoring and administration. It allows to view the monitors of other users in the LAN and remotely access their computers, fix technical problems or completely take control over a remote PC. Max PC Privacy is a utility in Internet and Window Privacy, it safely deletes online Internet tracks and program activity records that are stored in your browser and other hidden files on your PC. Essential Internet security solution for your PC that's easy-to-use. Featuring advanced firewall, preventive defense controls, extended spyware protection, web safety tools and live activity monitoring, Outpost will take care of your online safety. Privacy Shredder can help you delete all traces of your Internet and computer activities permanently. CommView is a program for monitoring Internet and Local Area Network (LAN) activity capable of capturing and analyzing network packets. With CommView you can see the list of network connections and vital IP statistics and examine individual packets.